Winter is right around the corner (as if you didn't know). If you live in a cold-weather climate, the only “yard work” you’re likely to be doing over the next several months is shoveling snow. Maybe thoughts of a new yard project in the spring will help keep you warm. How about a fence? A new fence around your yard can give it a fresh new look and help increase the resale value of your property. There are options out there that will allow you to spruce up your yard in an environmentally-friendly way. If you are looking to replace an old fence, eco-friendly yard experts recommend taking down the fence and recycling the pieces or taking them to a salvage yard. These are “greener” options as opposed to just throwing out the old material. You can also use salvaged material for your new fence. Some of the older wood might be better quality than newer wood. The availability of quality salvaged wood can depend on where you live. You may want to consider composite blends for your fence-building material. The composite blends will combine a natural fiber with salvaged wood. The one big question with composite blends is durability. Will they hold up over several years? Another environmentally-friendly option is making a fence out of bamboo. Check to see if there is any bamboo produced in your area. You can also construct a new fence made out of plants. A simple hedge may be just right for your yard. If you have questions, talk with a plant expert. This is also more on a long-term option, as it will take a few years for the plants to go to get the desired effect. 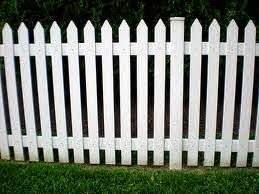 One thing you want to do if you are building a new fence in a new or different area is know your location. Make sure utility lines are located and marked. Check with your utilities companies to make sure your new fence is not in the way of any buried lines or cables. A utility company worker should be able to mark where any buried cable are on your property. You may also want to check with your sprinkler system company.